Note; Picture is for illustration purposes only. Actual product may differ in appearance. 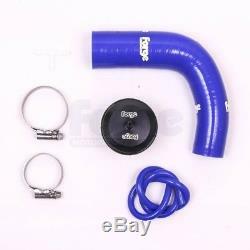 FMFOCSTDV Forge Motorsport Blow Off/Dump Valve Kit (Blue Hose) Ford Focus ST 225. In The Box: 1 x FMFOCSTDV Valve 1 x 35mm Hose Clamp 1 x 50mm Hose Clamp 1 x 500mm of 4mm Vacuum Tube 1 x 5mm T Piece 1 x Silicon Hose #1022 1 x Instructions 1 x Forge Sticker. 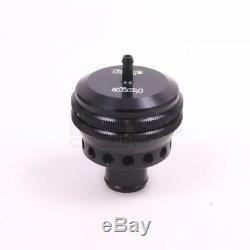 A remote Blow off, or Dump Valve Kit for the Ford Focus Mk2 ST225. This uses a twin piston valve to ensure compatibility with the engine management system and a custom silicone hose to ensure easy installation. This valve can be installed in combination with the OEM valve, or on it's own by using one of our blanking plates. The hose is available in red, blue, or black, and the valve is available in black. Please Check the fitment details and the application table in the listing prior to ordering to make sure you are ordering the correct part for your vehicle. We will not accept responsibility for parts ordered incorrectly. Fitment and application table provided in the listing is only intended to be used as a guide to identify if the part will fit your vehicle and NEVER a guarantee due to variations on Chassis or Engine number. LK Performance opened November 2003 where the former Larkspeed performance centre was located, bringing to Cleckheaton not only its renowned expertise in exhausts, engine and service parts but also in performance products. These range from exhausts, induction kits and up to the minute styling, including well known brand names in car entertainment and alloy wheels, as well as stocking an impressive range of clutches, filters, oils, etc. Brand New Showroom with On-Site Fitting. LK Performance aims to become the number one retailer of motor products in the Yorkshire region, but it does not stop there because our website with an online store has launched so we can provide our services on a global scale 24 hours a day 7 days a week 365 days a year. We accept all major Credit and Debit cards. Please make payable to LK Performance Styling. We make every effort to deliver goods within the estimated timescales, however delays are occasionally inevitable due to unforeseen factors. Saturday deliveries incur extra charges and are usually not guaranteed. We are unable to deliver to certain postcodes. All BT postcodes Isle of Man. The cost of returning the goods safely to us is your responsibility. We may not be able to accept back non-faulty goods that have been supplied to your specific order or damaged during transit or fitting. Where goods are alleged to be defective/faulty, the purchaser agrees to return such goods for inspection and report (without us replacing the said goods prior to such inspection). The purchaser also accepts that it is reasonable to inform us of any interruption, defect or other failure prior to contacting independent third parties or incurring expense and, in addition, to allow us to remedy the defect, failure. LK Performance Spenbeck Business Park Cleckheaton West Yorkshire BD19 4EW United Kingdom. Panther Silicone Hoses & Tubes. The item "Blow Off/Dump Valve Kit Blue Forge Motorsport Ford Focus ST 225 FMFOCSTDV" is in sale since Thursday, February 15, 2018. This item is in the category "Vehicle Parts & Accessories\Car Tuning & Styling\Air Intake & Induction\Dump, Bypass & Blow-Off Valves". 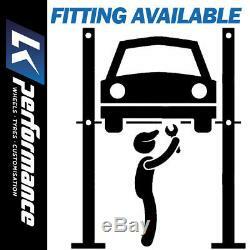 The seller is "lkperformance" and is located in Cleckheaton. This item can be shipped to United Kingdom, Austria, Belgium, Bulgaria, Croatia, Cyprus, Czech republic, Denmark, Estonia, Finland, France, Germany, Greece, Hungary, Ireland, Italy, Latvia, Lithuania, Luxembourg, Malta, Netherlands, Poland, Portugal, Romania, Slovakia, Slovenia, Spain, Sweden, Australia, United States, Canada, Brazil, Japan, New Zealand, Israel, Hong Kong, Norway, Indonesia, Malaysia, Mexico, Singapore, South Korea, Switzerland, Taiwan, Thailand, Saudi arabia, South africa, United arab emirates, Ukraine, Chile.